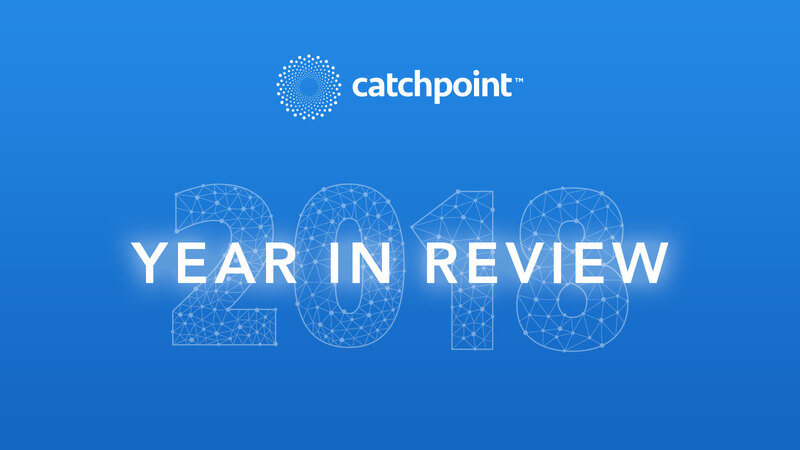 2018 was a big year for the Catchpoint platform. Our product team, engineers, and designers made massive improvements to our platform. We updated our user interface, launched new monitors, and created better ways for users to organize and visualize their data. All in all, these changes are improving mean time to identify (MTTI) and mean time to resolve (MTTR) for our customers. Our new SaaS monitoring also makes it easier than ever to monitor SaaS apps and uphold vendors to their service level agreements. In this article, we’ll recap some of our most significant product improvements from 2018. In October, we launched a new Default Dashboard and a new Node Dashboard. With both dashboards, the goal was to help our customers find answers to their problems faster. 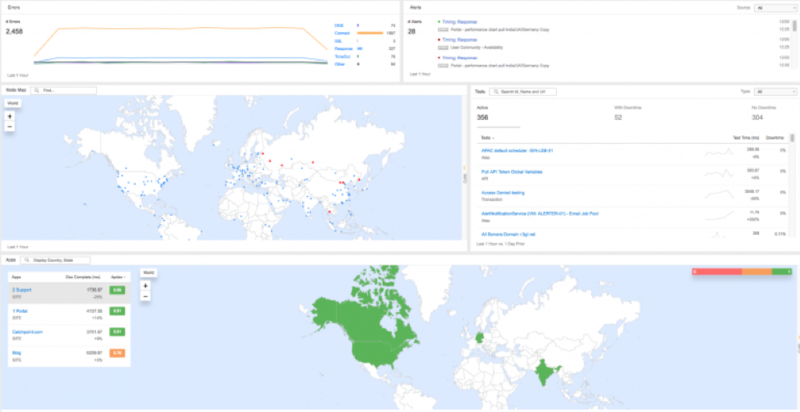 The dashboards display summaries of key alerts, tests, and global measurements of end user experience. The new Default Dashboard displays both Synthetic and Real User Monitoring data so long as the viewer is using both Synthetic and RUM. Integrated RUM and Synthetic—easily swap between analyzing a Synthetic test and RUM app. All test and monitor types are supported in Smartboard, so you can view any test you’ve run. Improved layout—the key metric charts have been merged into one widget. View data by dimension or by metric group. Key metric override—click on any of the key metrics to change the selected metric in charts and tables. Significant improvements were made to our Real User Monitoring solution. These changes allow our users to collect more data with network error logging and made visual enhancements to our RUM product. These tests help Catchpoint users understand the full scope of user experience, whether positive or negative. Through sending NEL data to Catchpoint, customers can go further by pinpointing why any given user is unable to reach the site, revealing previously unknown trends and missed opportunities. This vital data identifies where errors occur and how they can be addressed—improving DNS routing, network management, and availability. 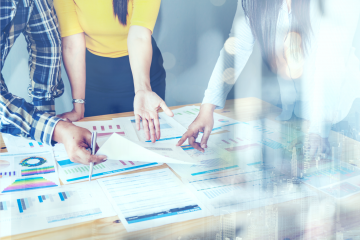 Real User Smartboards highlight critical performance data enabling our customers to troubleshoot issues affecting users. They also help identify correlations between performance and user engagement or behavior. Measurements include detailed data about the user’s environment and include an option to sort by highest impact. Synthetic monitoring also saw major improvements in 2018. We built tools for monitoring event-driven services, made data easier to filter, and launched Enterprise Node and monitoring capabilities for different Chrome versions. 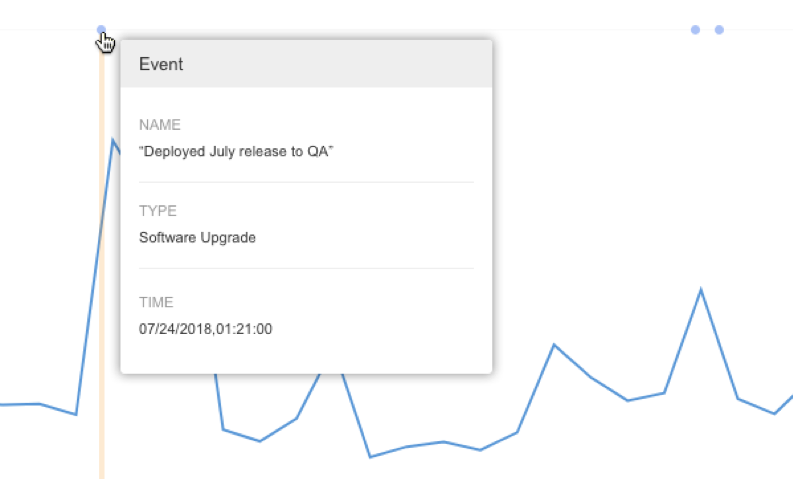 Catchpoint Events allow our users to post events from their DevOps tools, change management, or any other event-driven service directly into Catchpoint. 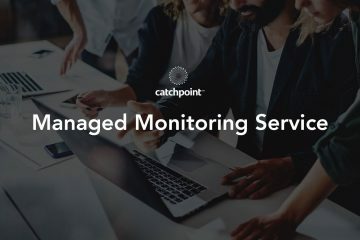 Our platform automatically tags relevant performance data with the event, so our users can correlate changes or issues to infrastructure with data in Catchpoint. Catchpoint Labels allow our users to tag individual tests with one or more labels. Our users often have huge test inventories, often more than hundreds, even thousands. With labels, it’s much easier to search for an individual test based on the label(s). Testing sites in different Chrome versions was challenging as Chrome uses three different types (Stable, Beta, Developer)—making IT managers choose whether to test their site in the current or next version of Chrome. We released Catchpoint Chrome versions testing to make it easy for IT teams to test different versions of Chrome. Catchpoint users can now run tests using the Chrome version of their choice. Chrome 59, 63, and 53 are available for Web tests, HTML tests, and Transaction tests. Stable (default, 59): The most recent version of Chrome. 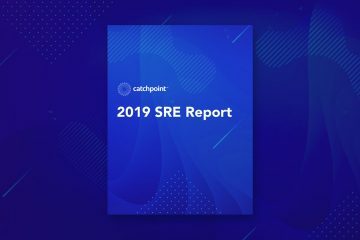 Catchpoint fully supports this version. Preview (63): The version of Chrome being tested for compatibility with Catchpoint. Specific (53): An individual version of Chrome to be used for test runs. This test is useful for users who have most customers on a specific or older version of Chrome. A specific version can be used to test user experience for the selected Chrome version. The number of providers and users in the cloud is growing at an exponential rate. So, the cloud is a pivotal element of modern delivery chains. We wanted our users to have the ability to measure speed and availability of services from the vantage point of the cloud as well as from our enterprise nodes. With the growing number of SaaS applications and vendors contributing to modern web infrastructure, we decided to launch SaaS monitoring. Our turnkey tests allow users to view the performance of vital SaaS applications with a single click. Our SaaS monitors also make it much easier for our customers to uphold their vendors to their service level agreements. The uptime and availability of Office 365 is essential to many businesses (including ours). Our users can monitor Office 365 apps to ensure downtime doesn’t affect company or employee productivity. Salesforce is another vital SaaS application to many businesses. We launched our SaaS monitoring with a one-click Salesforce monitor so that our users can keep their sales team, and any other team relying on Salesforce, productive. 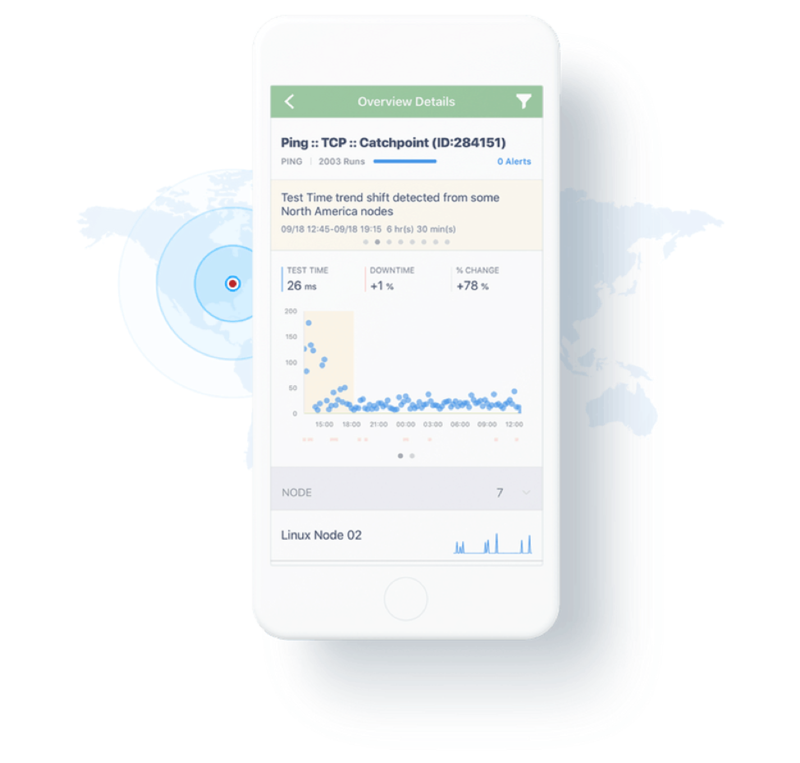 This year, we also put the power of Catchpoint’s monitoring solution into a mobile app (see the image above under Enterprise Node management). This means our users can keep an eye on performance without staying behind a desktop. The mobile app keeps our users updated on the performance of their synthetic tests and allows access to key data. With notifications enabled; users can view important details to determine the severity of an issue quickly. This post was co-written by Craig Lowell and Kayla Lee of Catchpoint.